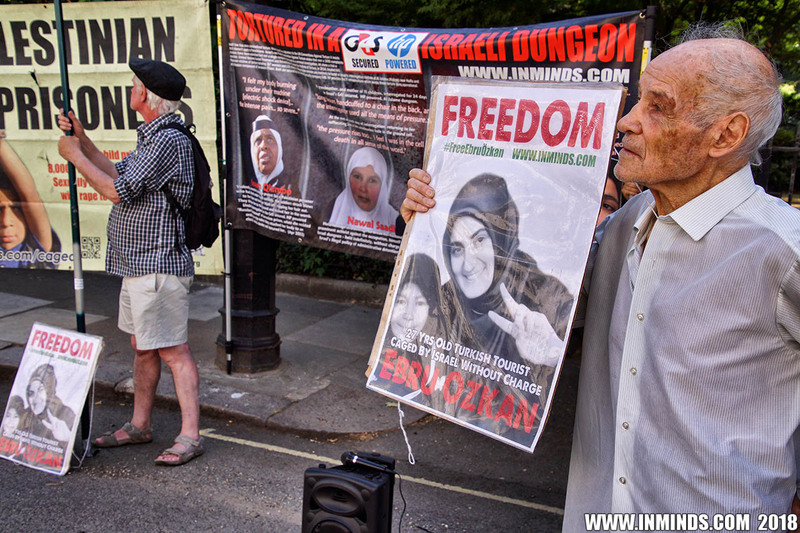 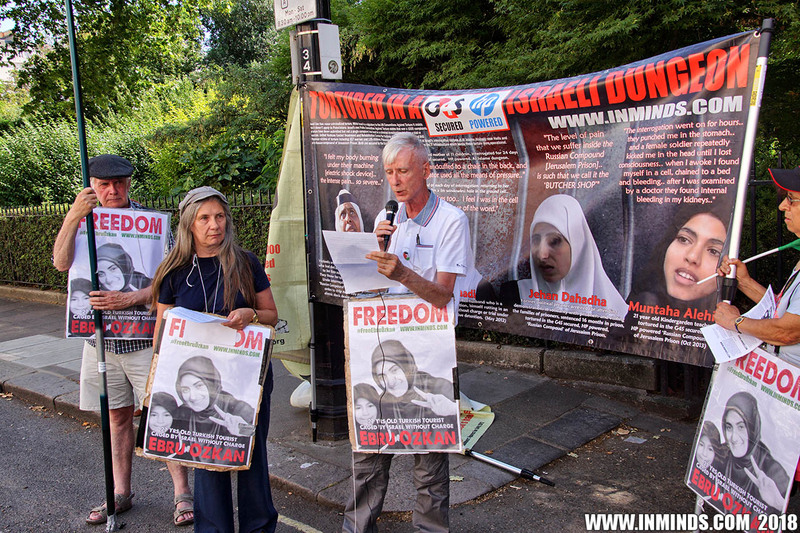 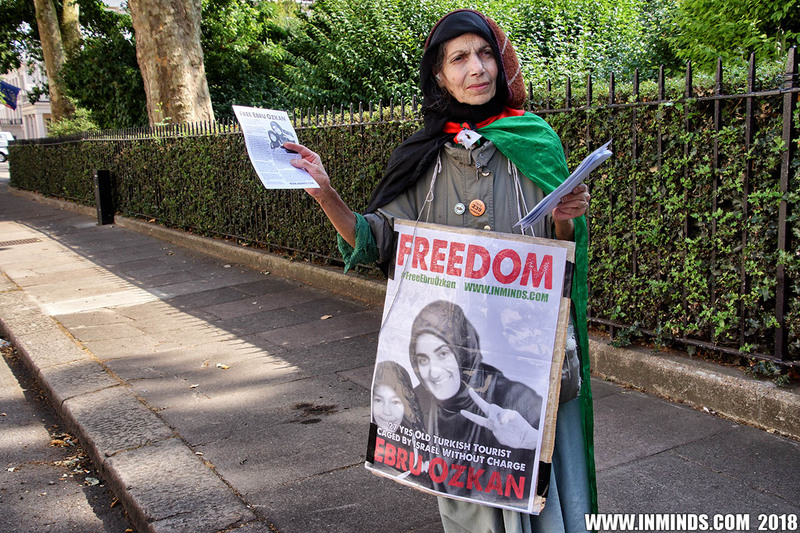 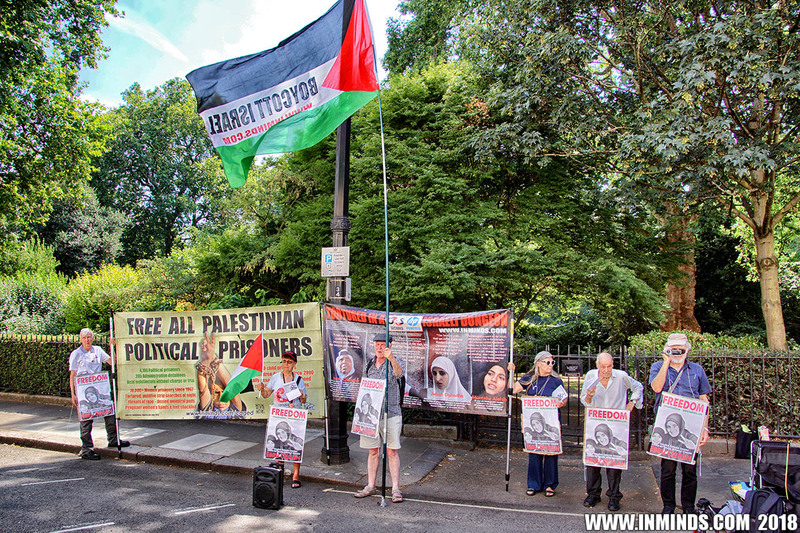 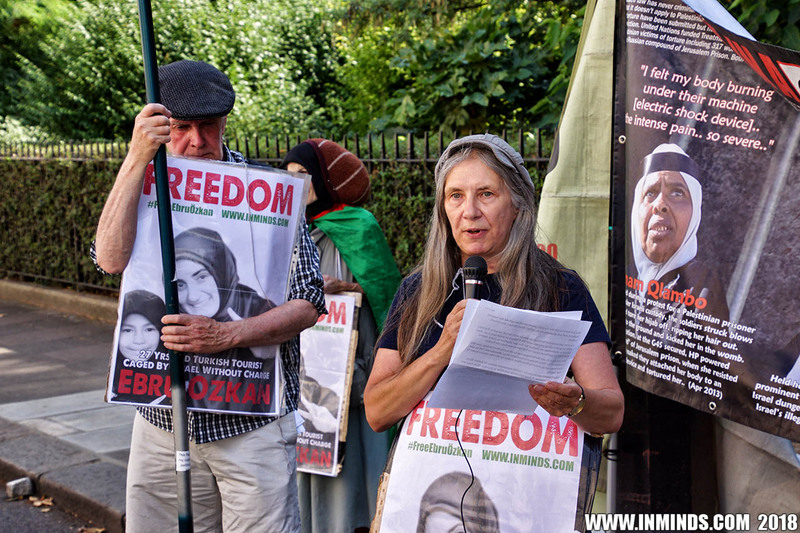 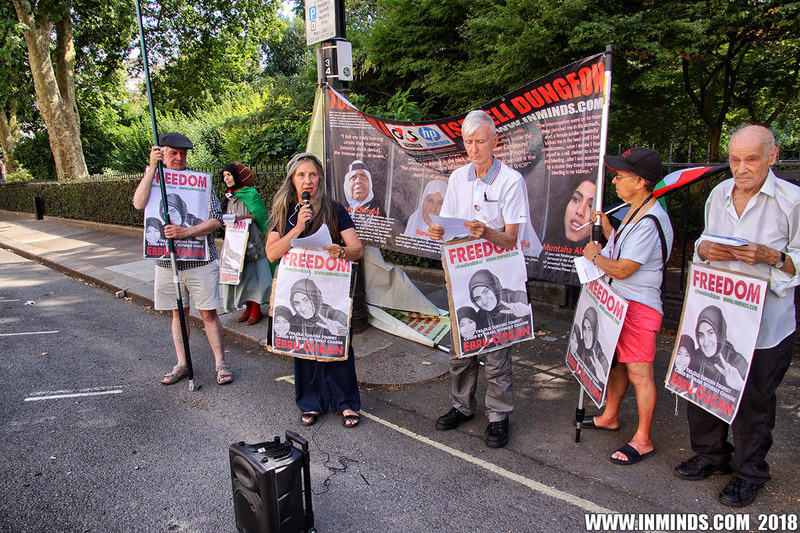 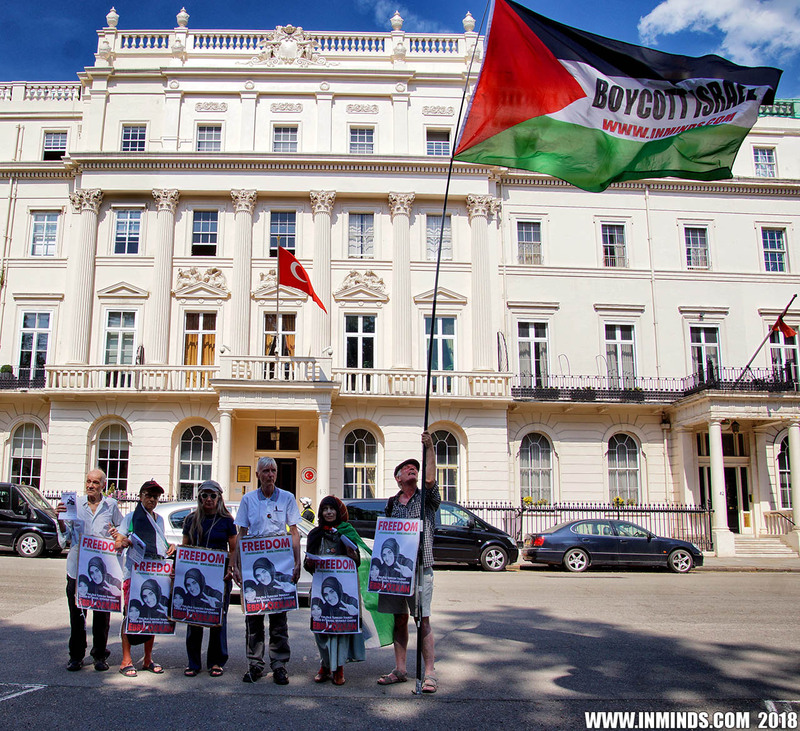 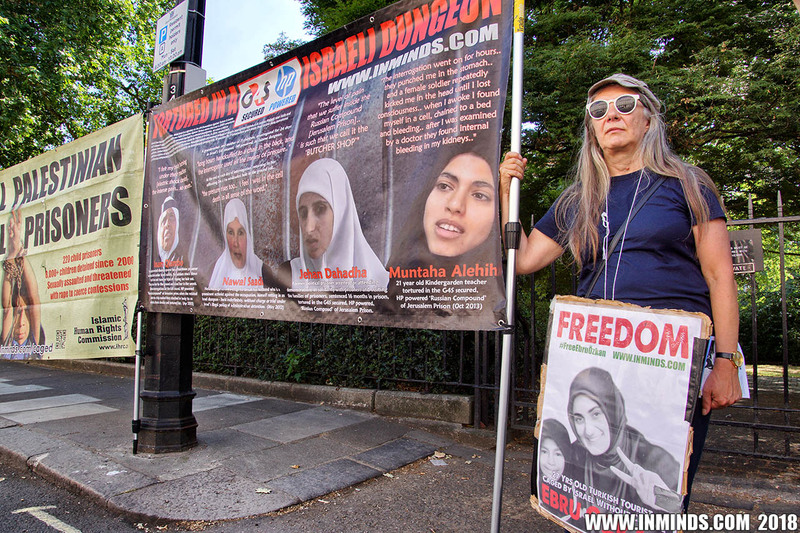 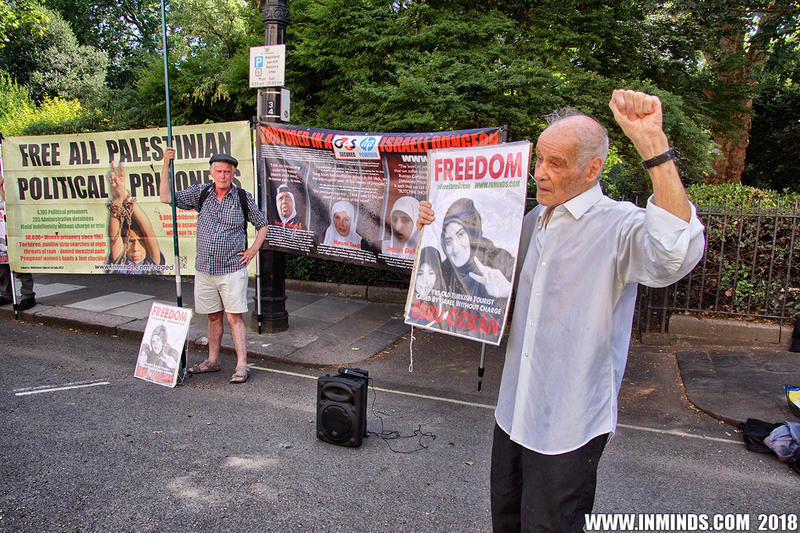 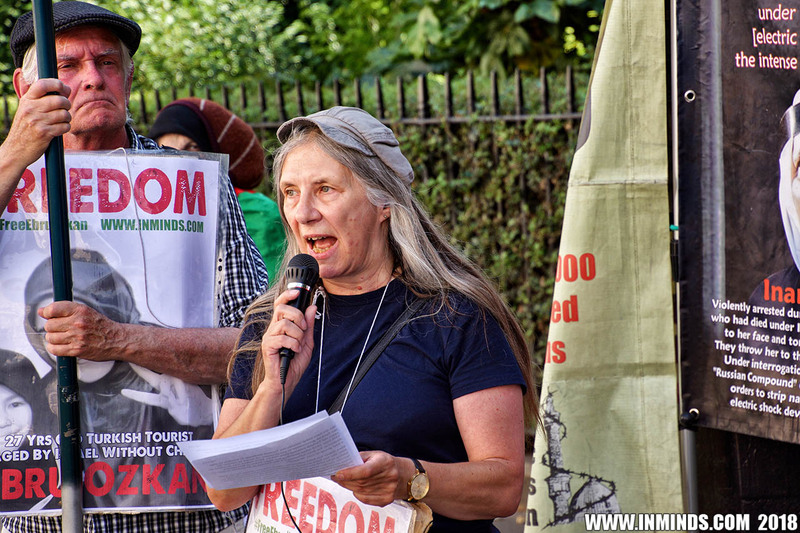 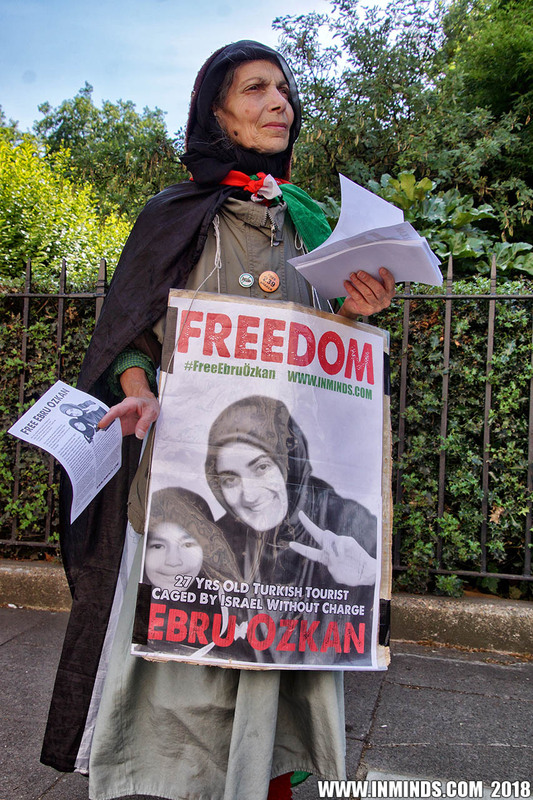 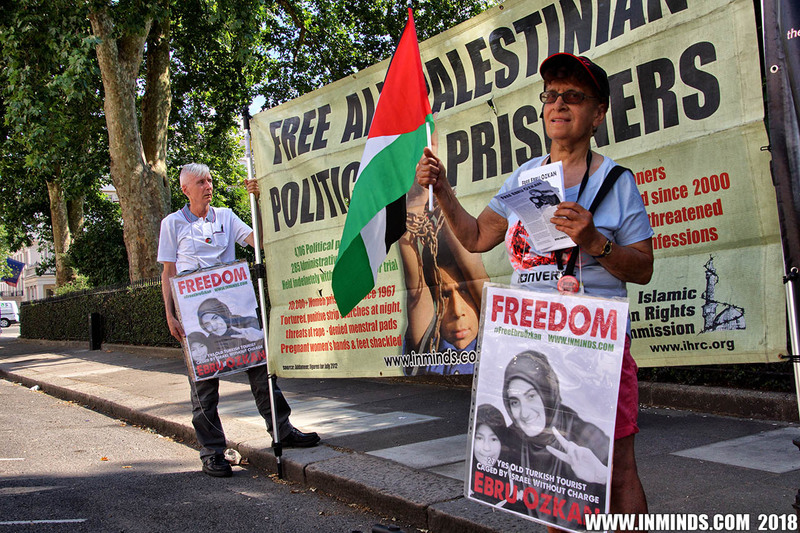 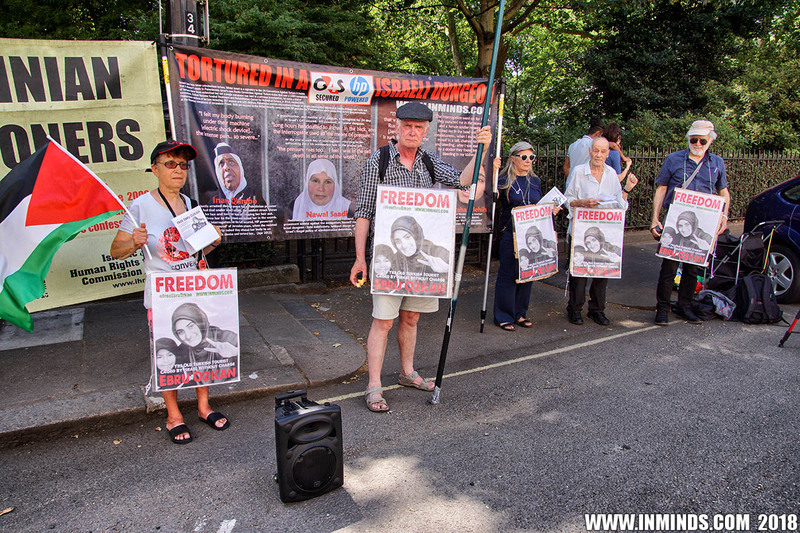 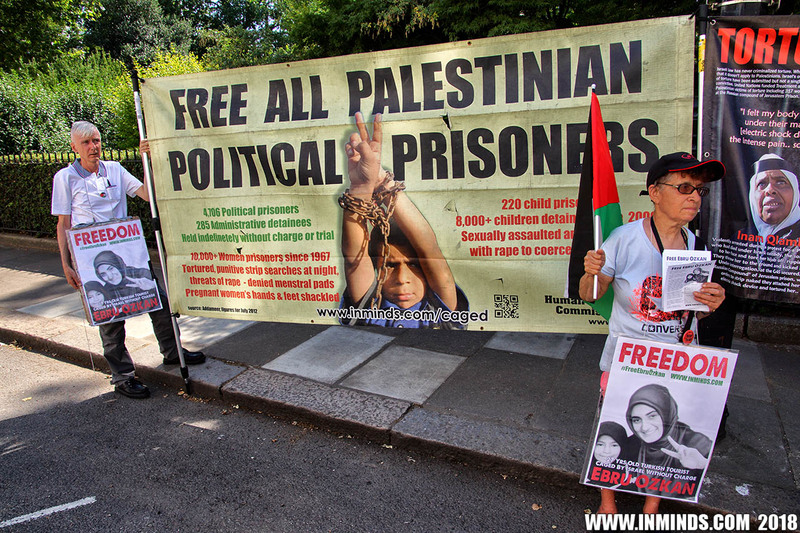 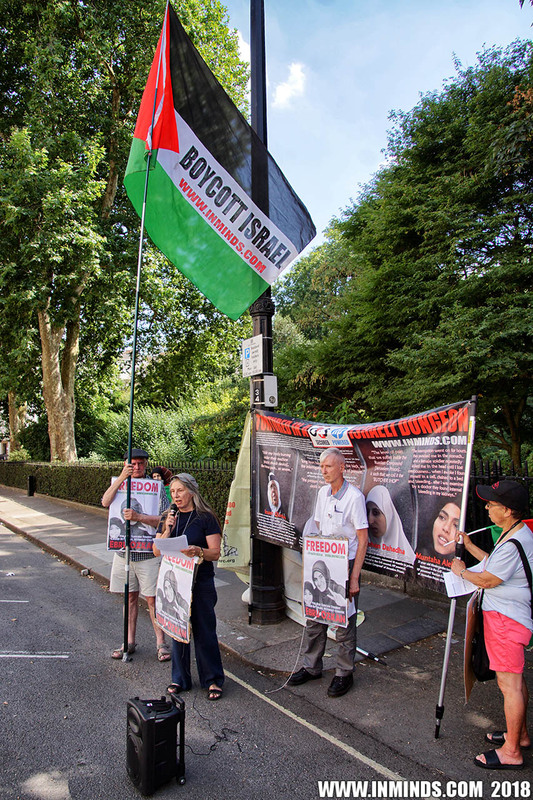 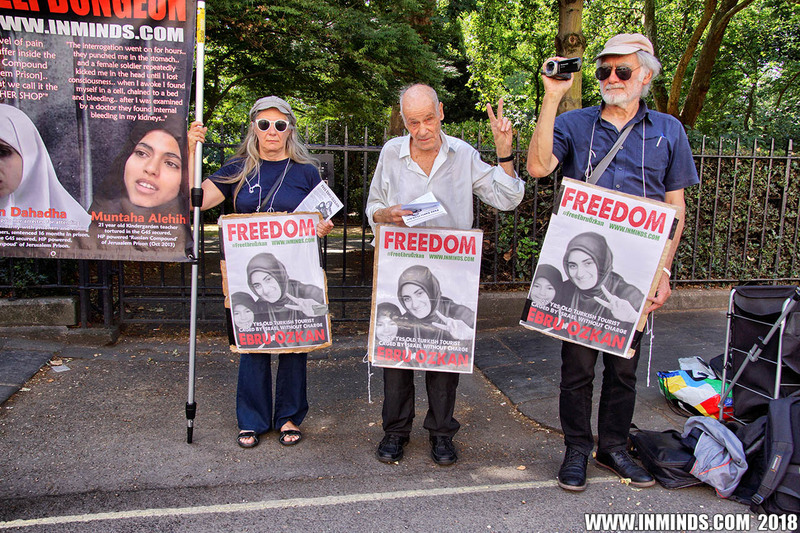 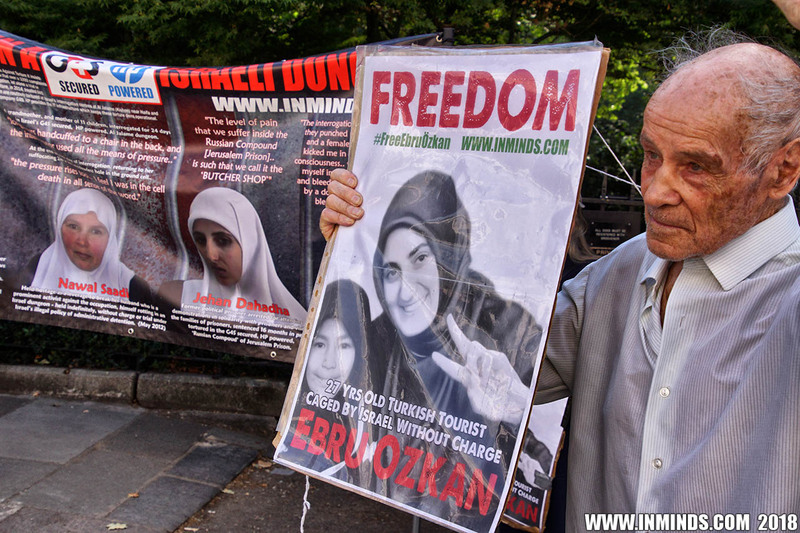 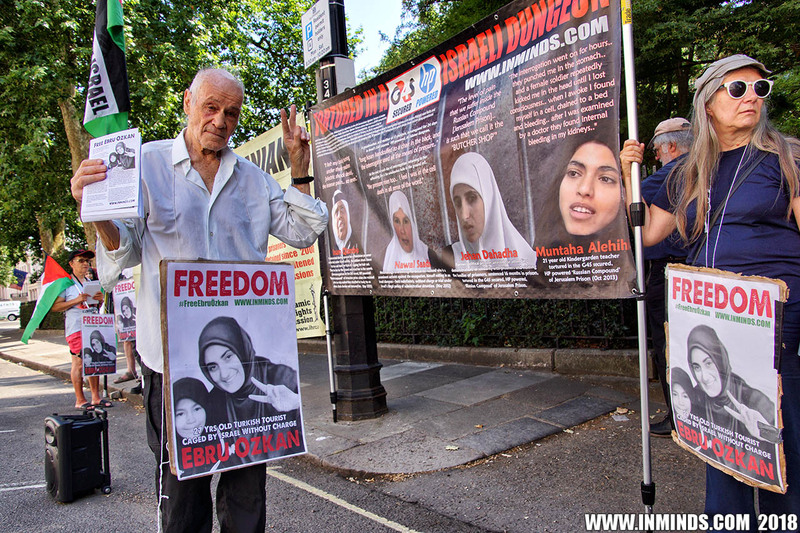 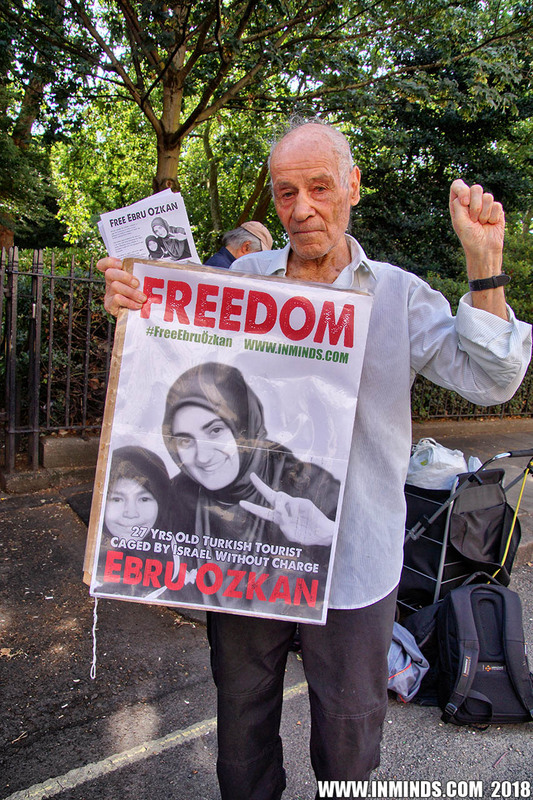 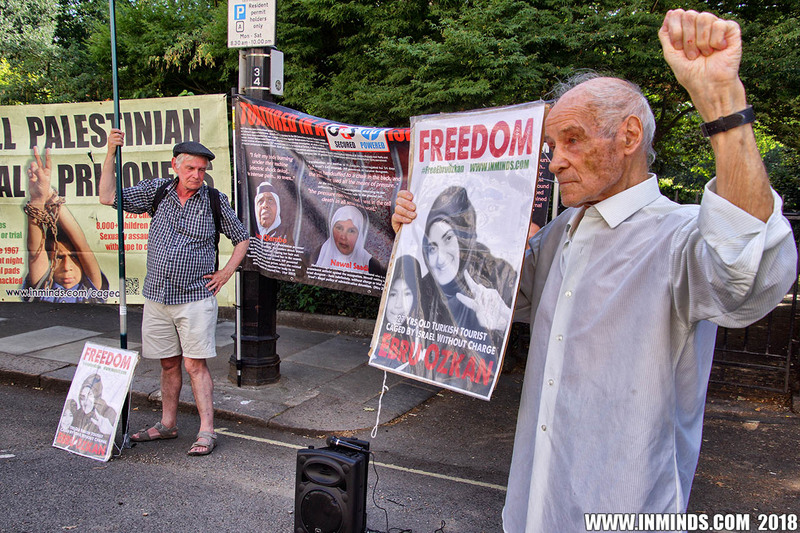 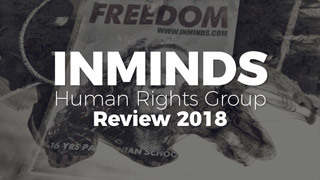 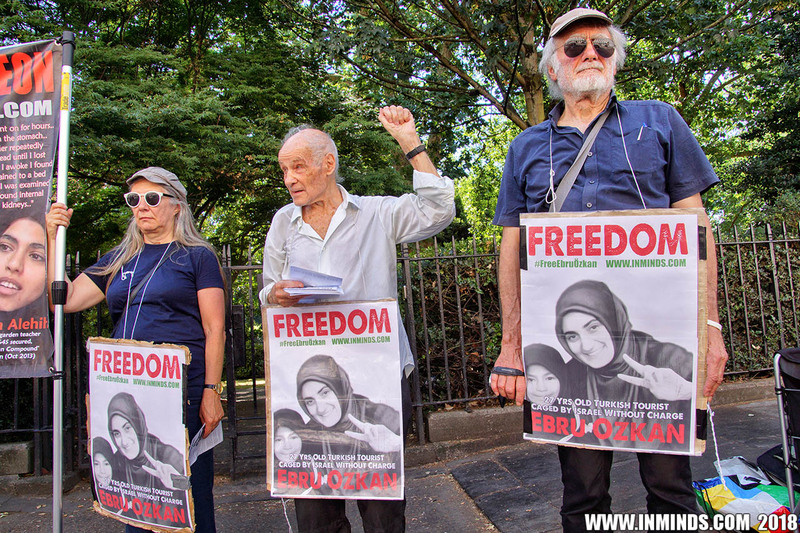 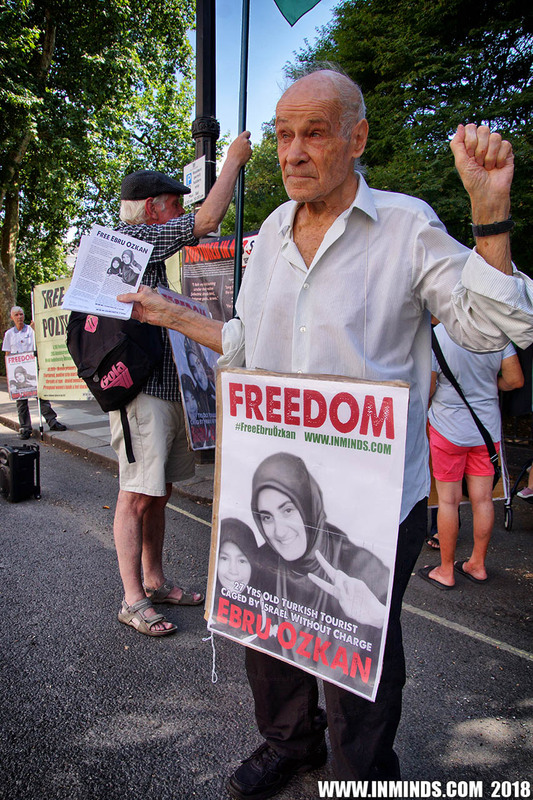 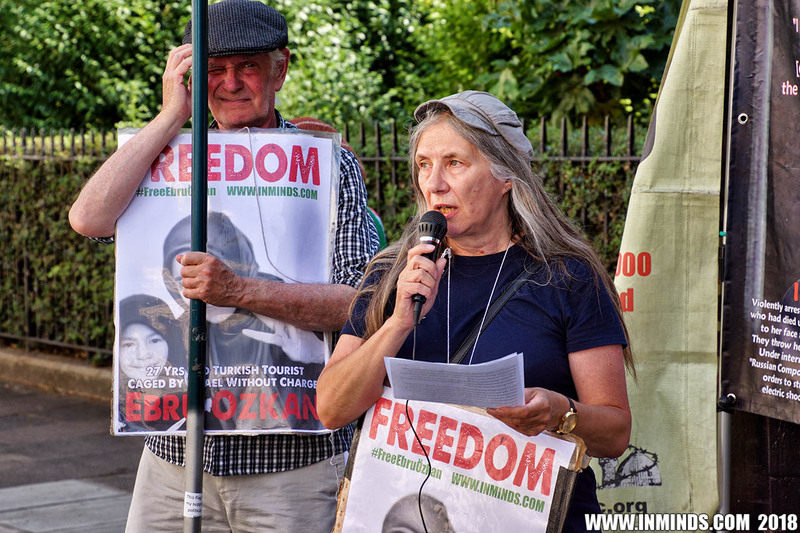 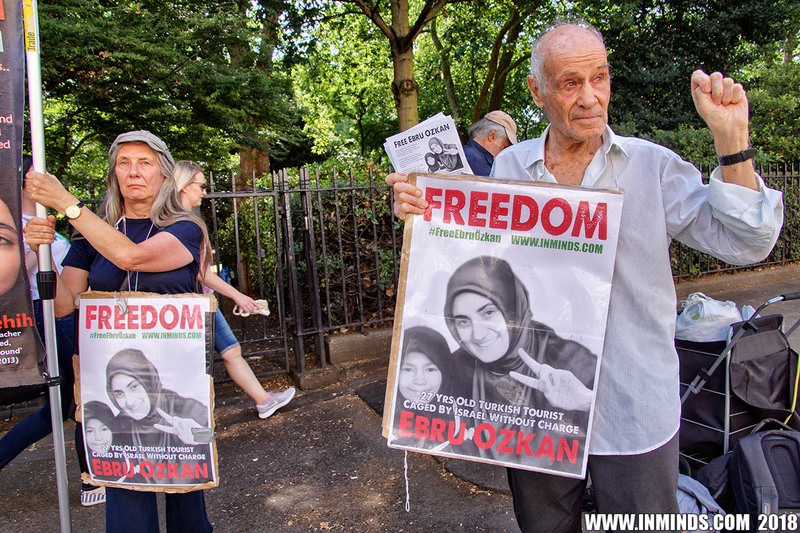 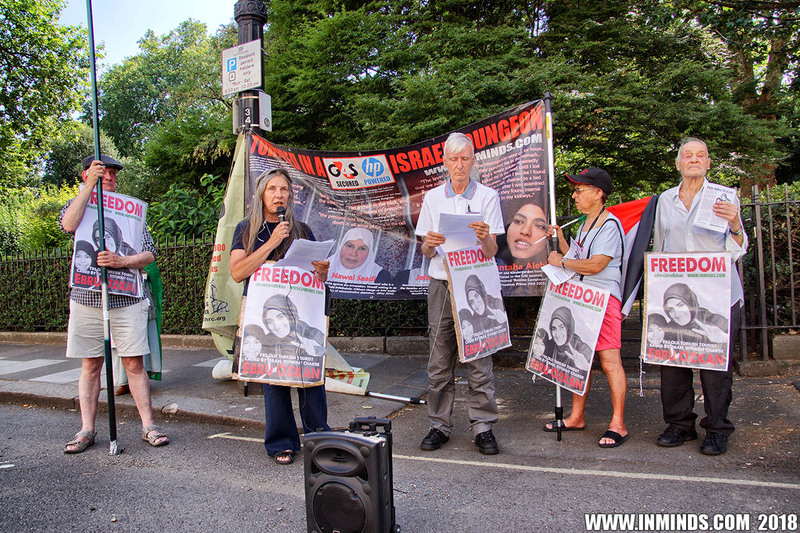 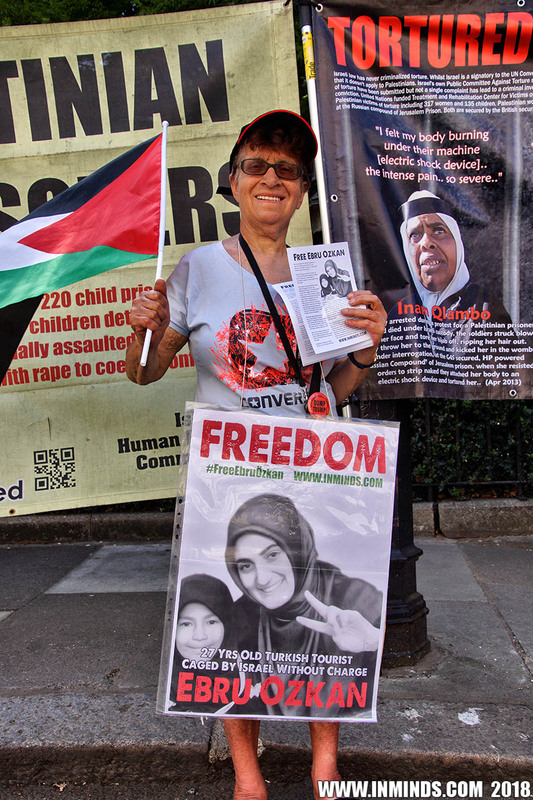 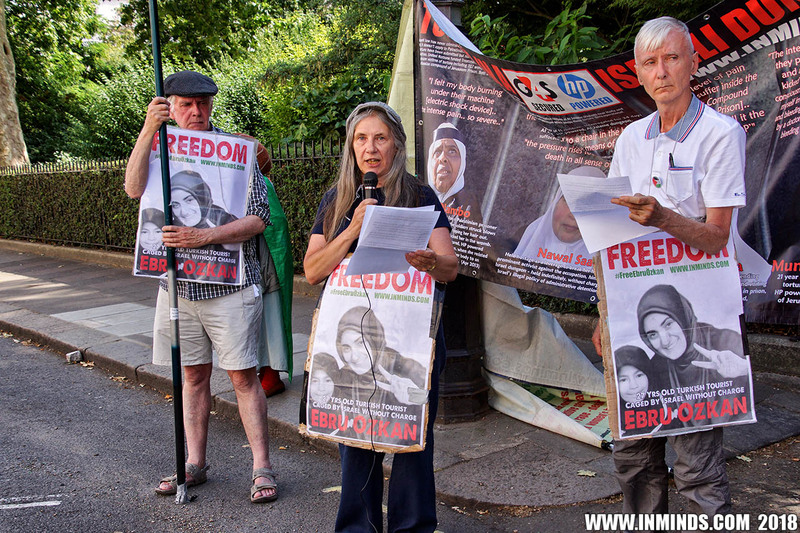 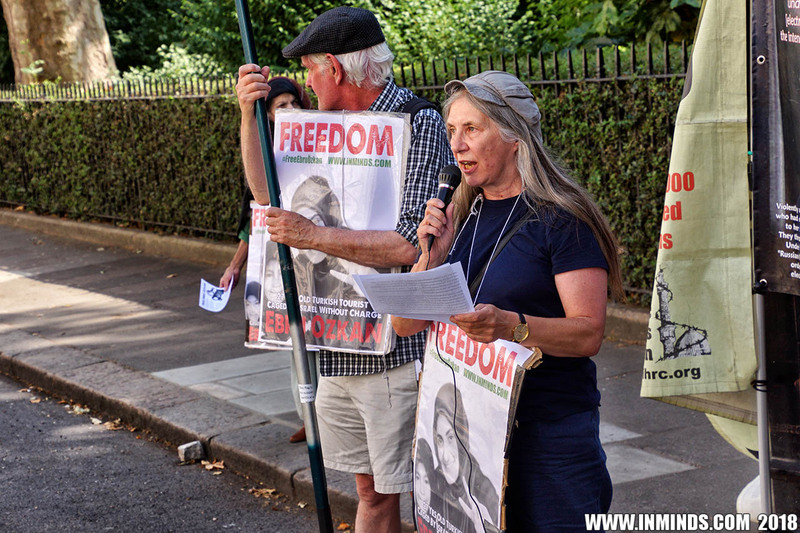 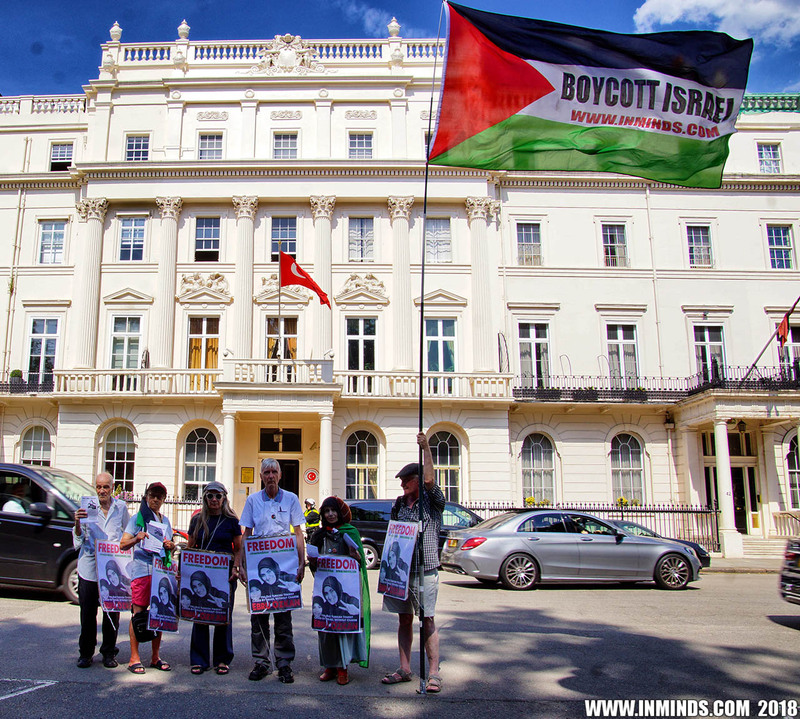 On 6th July 2018 Inminds human rights group held a vigil outside the Turkish Embassy in London to urge the Turkish government to put pressure on Israel to release 27 years old Turkish national Ebru Ozkan. 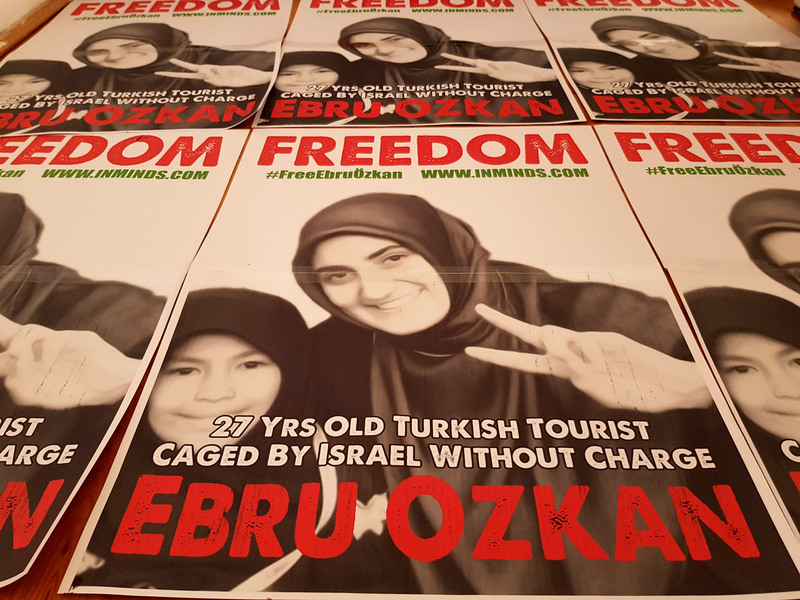 Ebru Ozkan was arrested on 11th June 2018 when boarding her flight home at Ben Gurion Airport in Tel Aviv following a 4 day holiday in Jerusalem as part of a tour group of over 30 people. 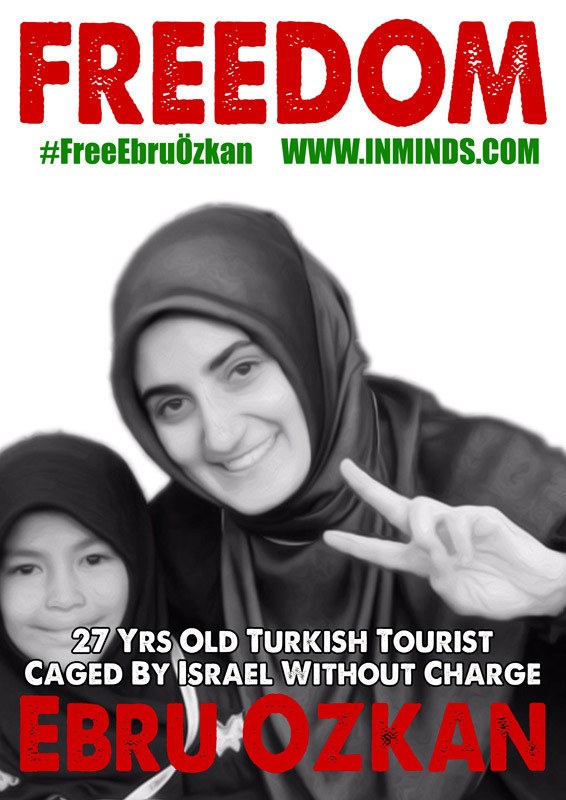 Ebru Ozkan has been arbitrarily caged without charge for 24 days now. 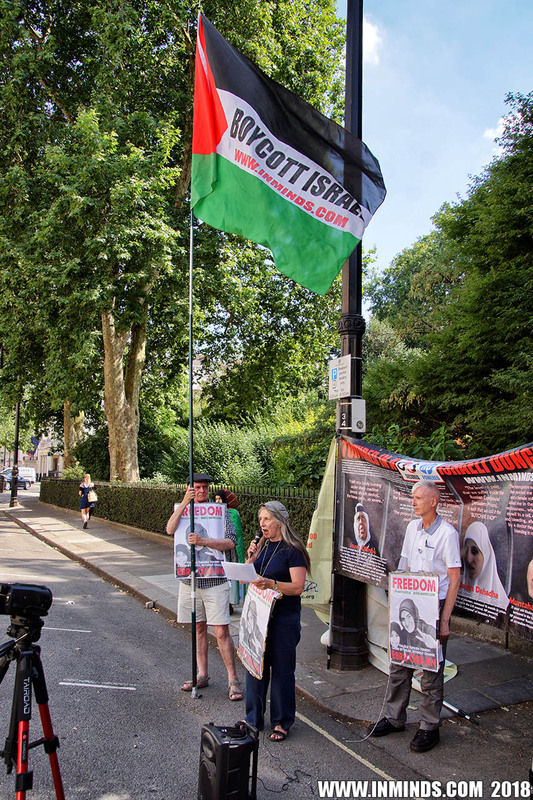 She has been accused for "threatening Israel’s security and having links with terrorist groups" - a catch all accusation with no specific charges being levelled. 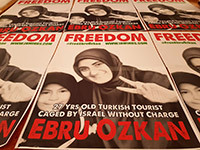 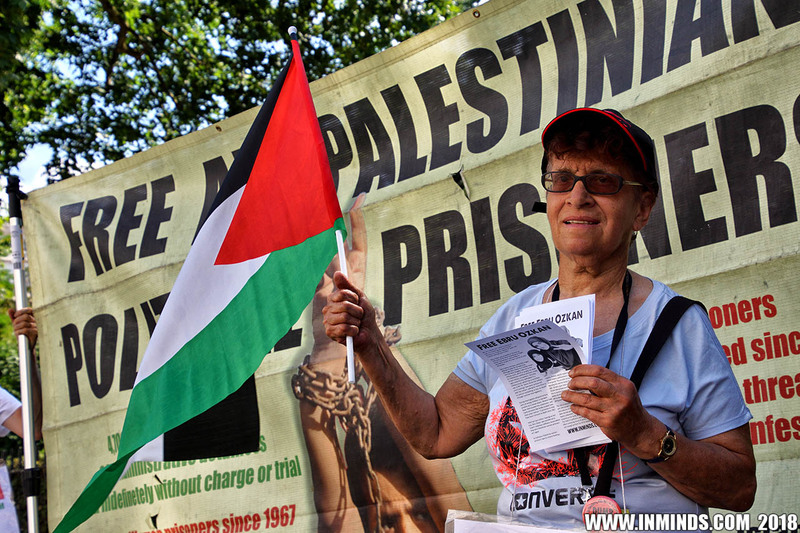 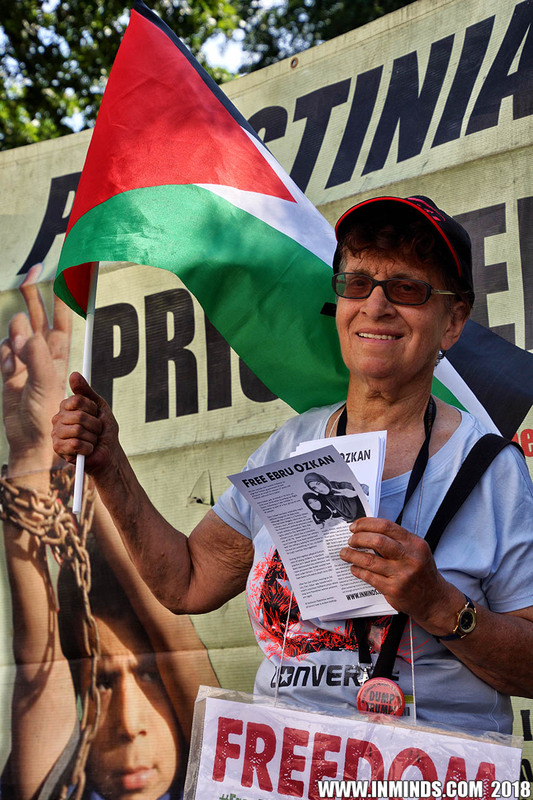 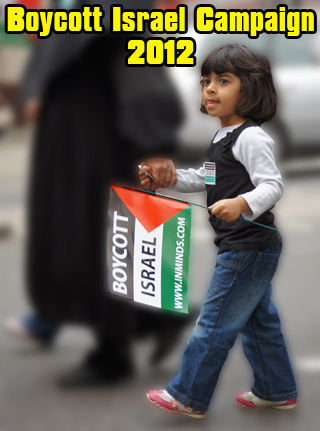 Although she is a Turkish citizen she has been referred to the military court, usually set aside for Palestinians political prisoners under Israeli military occupation where very few rights exist for the defendant and which has a conviction rate of 99.7%. 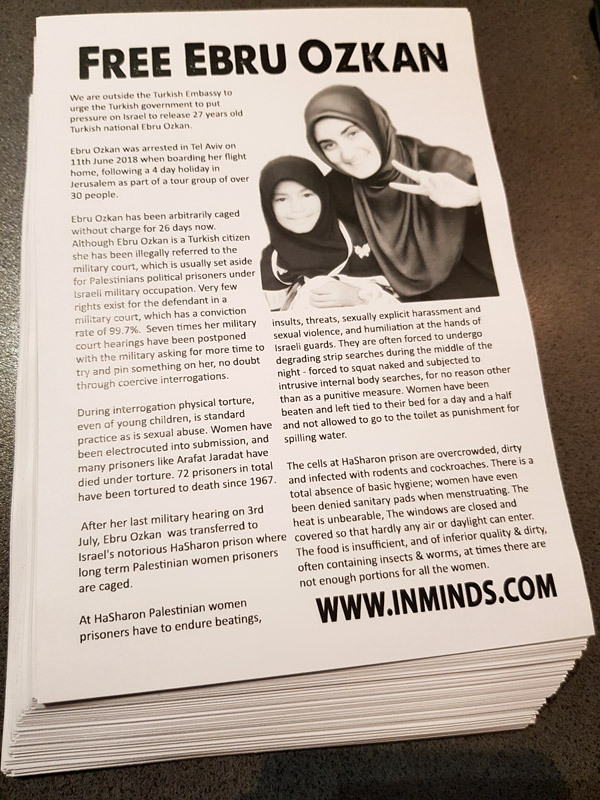 Seven times her military court hearings have been postponed with the military asking for more time to try and pin something on her, no doubt through coercive interrogations. 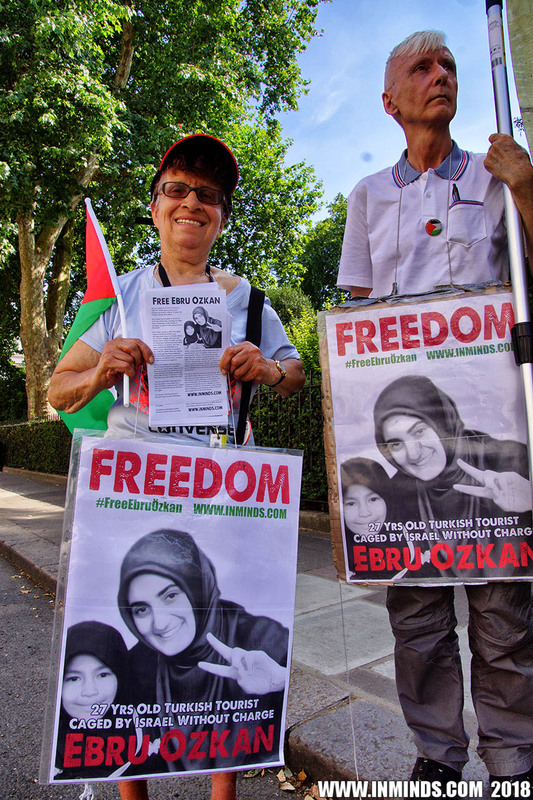 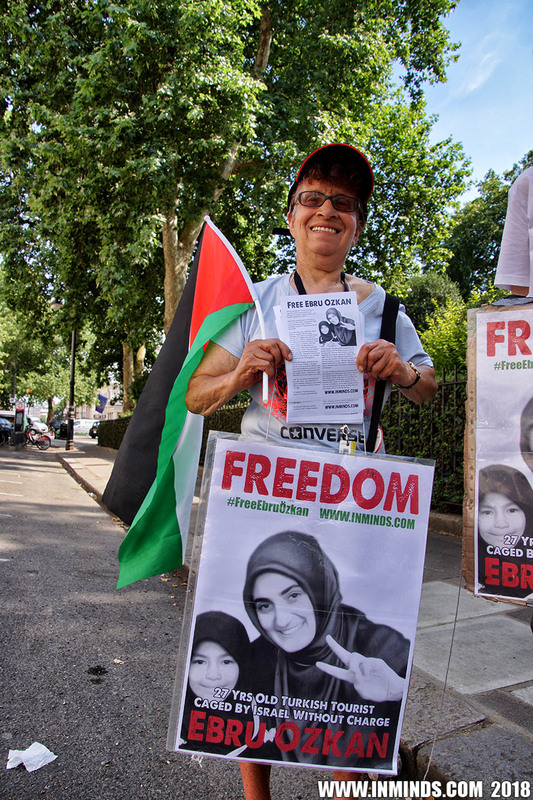 After the last hearing, on 3rd July, Ebru Ozkan was transferred to Israel's notorious HaSharon prison where long term Palestinian women prisoners are caged. 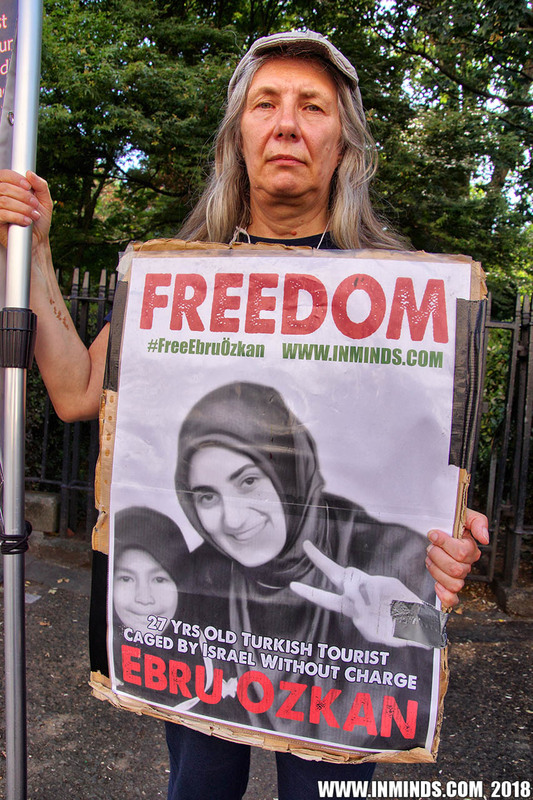 Her next hearing is scheduled for Monday 9th July. 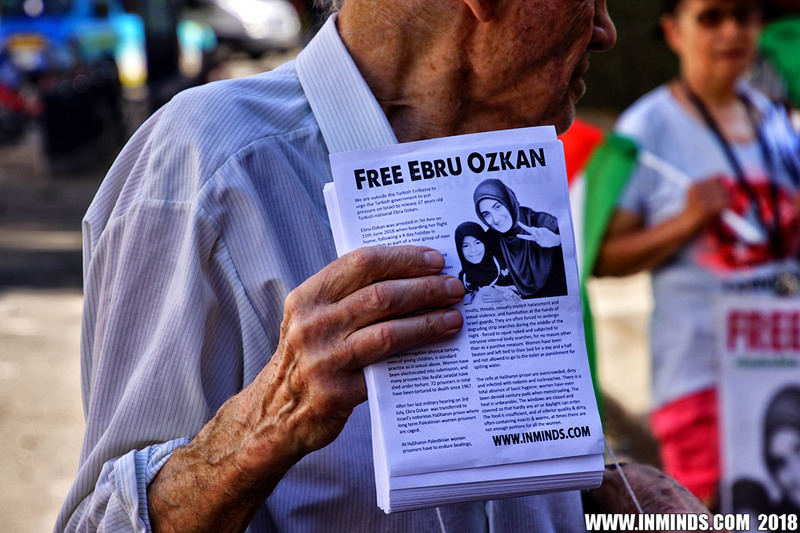 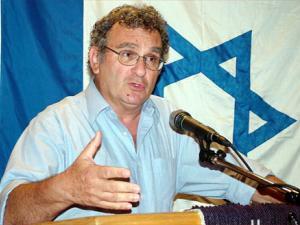 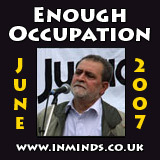 Inminds chair Abbas Ali said "We are here to tell the Turkish government to uphold the nations honour and not abandon its daughter, Ebru Ozkan, into Israeli hands. 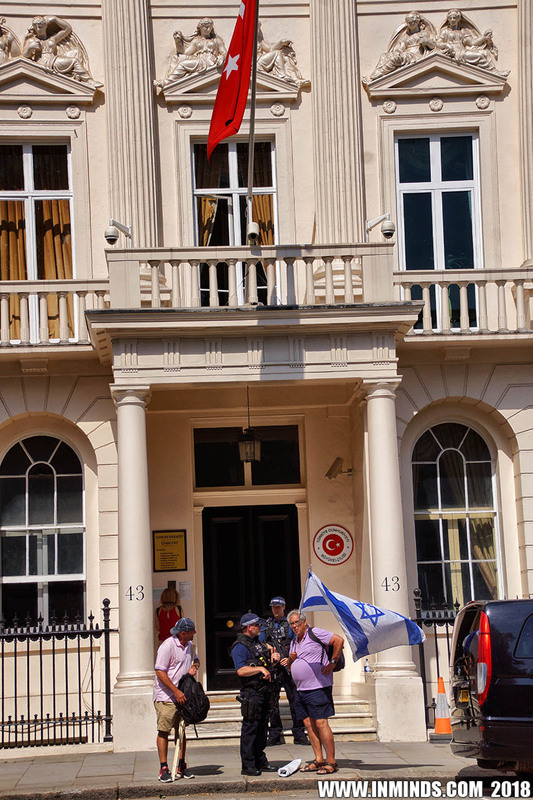 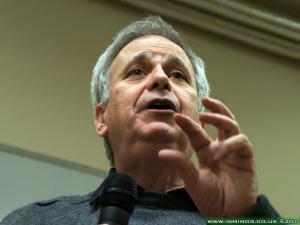 Turkey has immense leveraging power with Israel, with Israel being Turkeys 10th largest trading partner with $4.9 billion in trade last year; with Israel counting on Turkey for the pipeline to carry stolen Palestinian gas to Europe. 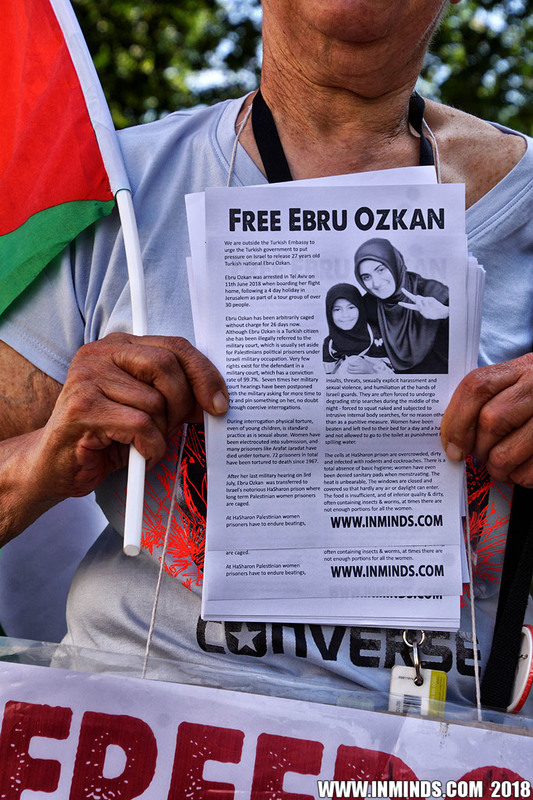 We are here to ask Mr Erdogan not to abandon Ebru Ozkan, like the victims of the Mavi Marmara massacre were abandoned, but to use his leveraging power to free Ebru Ozkan so she can return home to her family." 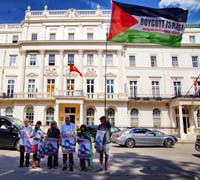 When we arrived for the vigil there were two armed guards at the door of the embassy, we handed them two copied of our leaflet, one for them and one to give to the embassy, explaining what the protest is about. 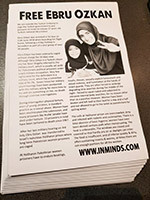 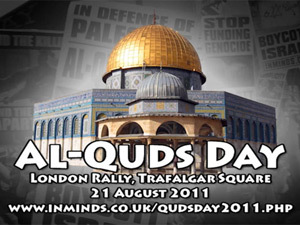 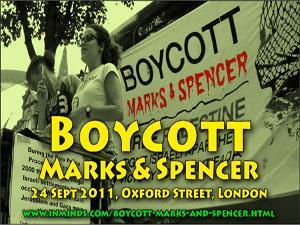 They took the leaflet inside and told us they had already been made aware of our protest by their command. 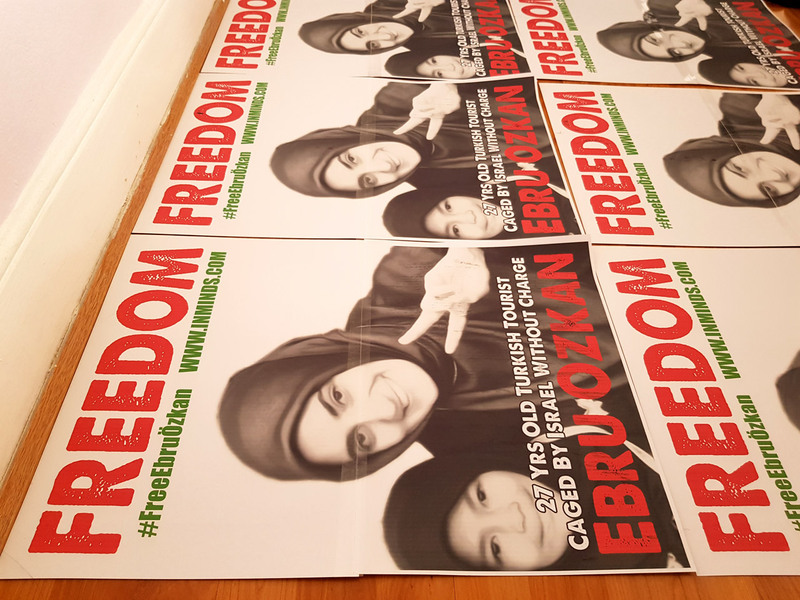 We asked if we could see someone from the embassy about Ebru Ozkan's case, the police told us they had passed the leaflet to the embassy but the embassy were not prepared to come out to talk to us. 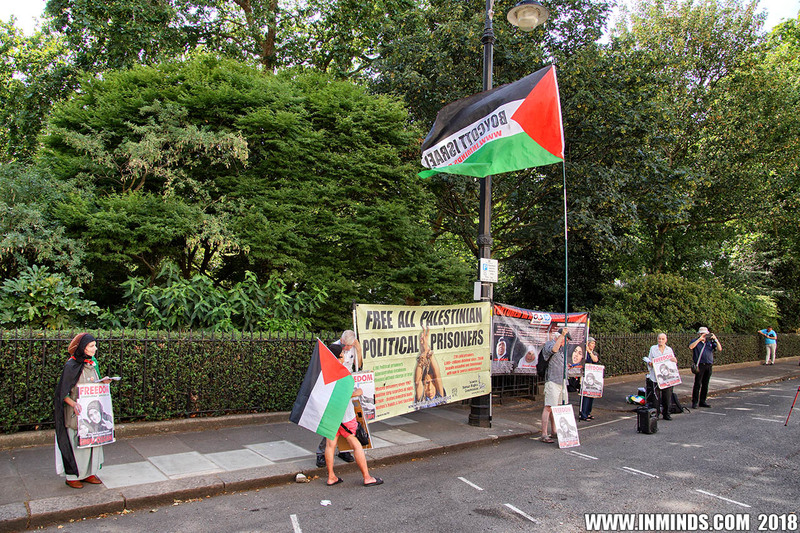 They told us to move to the other side of the road. 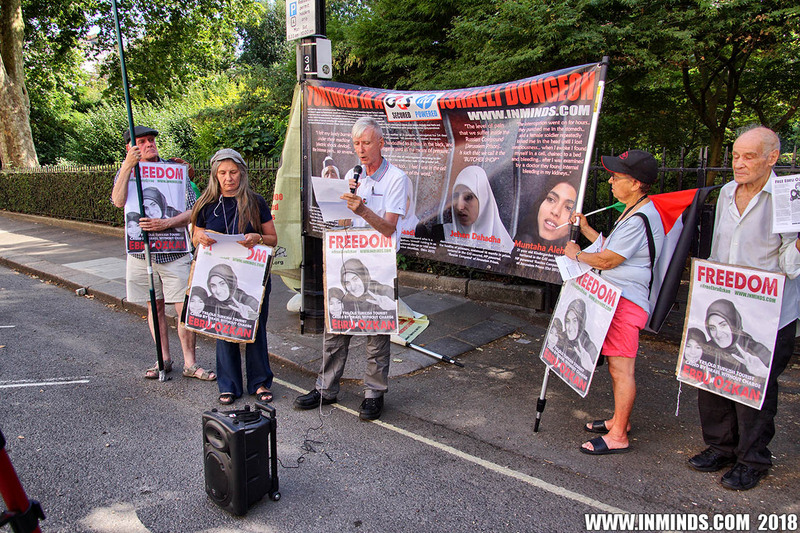 We explained we were exerting our right to hold the vigil on the pavement outside the embassy, the pavement was wide and we were only a handful so there was no chance of obstructing the path. 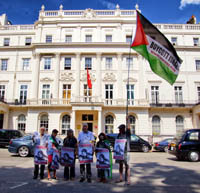 They said they will consult the embassy before deciding what to do, few minute later they emerged from the embassy and called the regular police who unbelievably forced us to move to the other side of the street by imposing conditions on our protest under section 14 of the Public Order Act 1986. 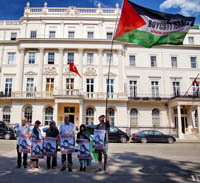 This was an abuse of the law, at the time there were only 5 of us, most were over 70 years old yet the police claimed we were a 'serious threat to public disorder, serious damage to property or serious disruption to the life of the community' and that our presence was 'intimidating the embassy' if we didn't cross the road they would arrest us, and would be liable on conviction to imprisonment for up to 3 months. 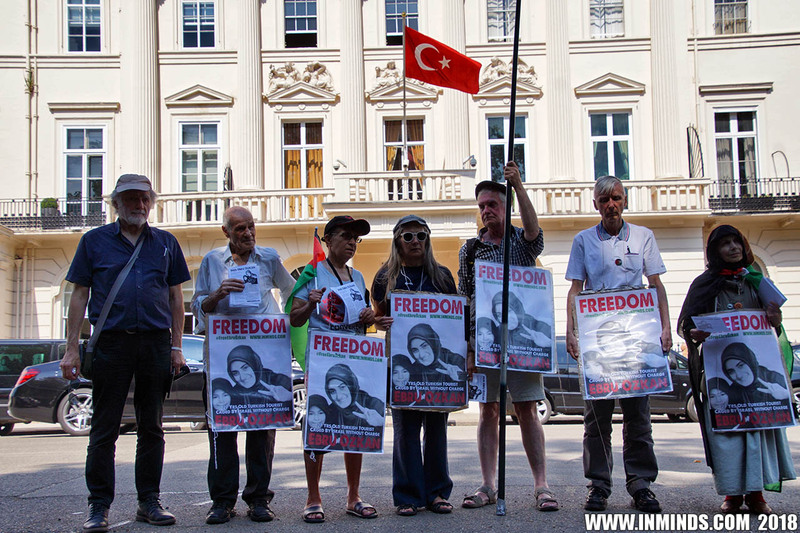 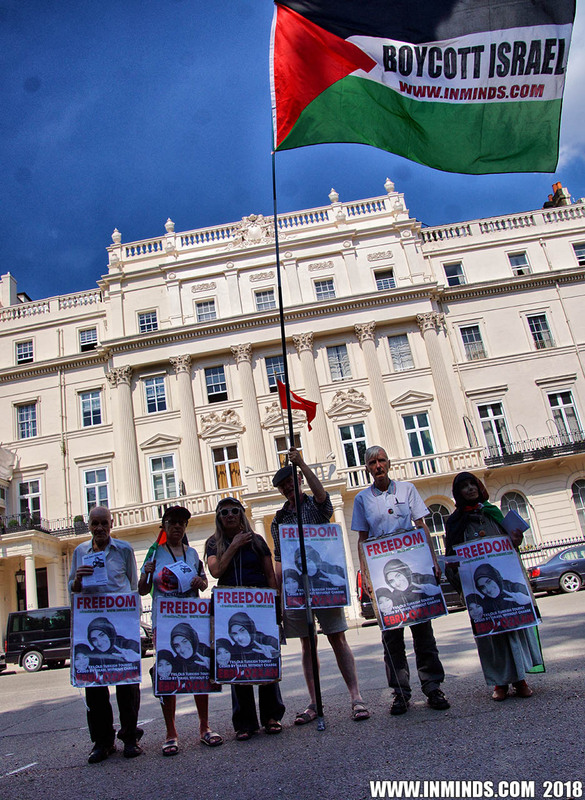 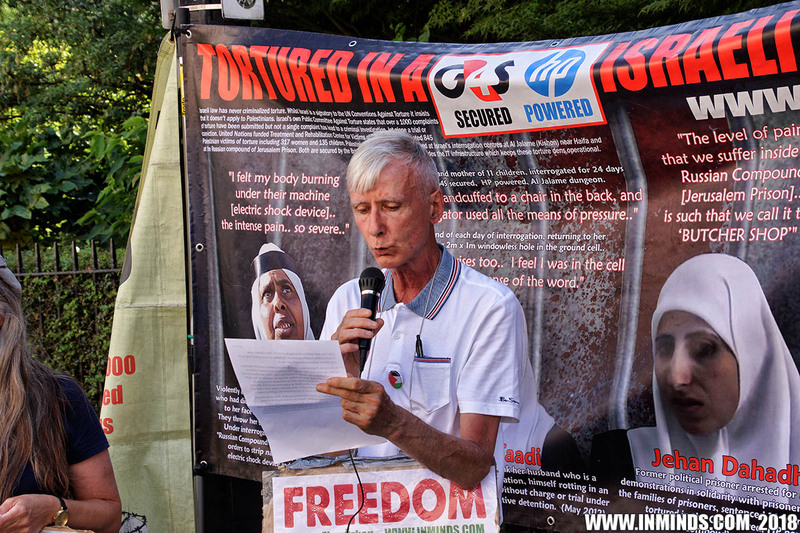 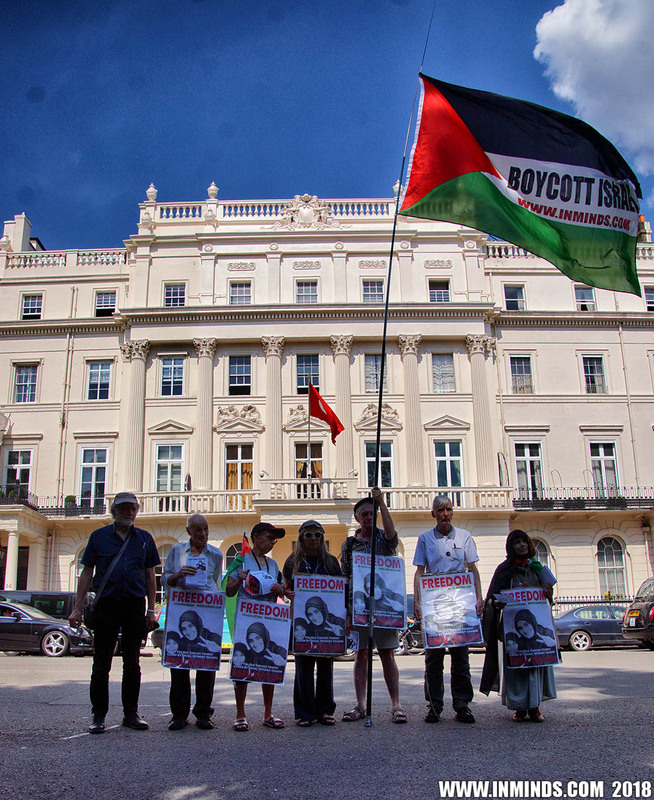 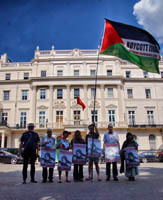 Inminds chair Abbas Ali said "We are very disappointed by the belligerent behaviour of the Turkish Embassy towards a vigil supporting one of their own citizens who has been abducted by a foreign power. 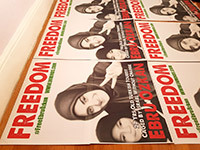 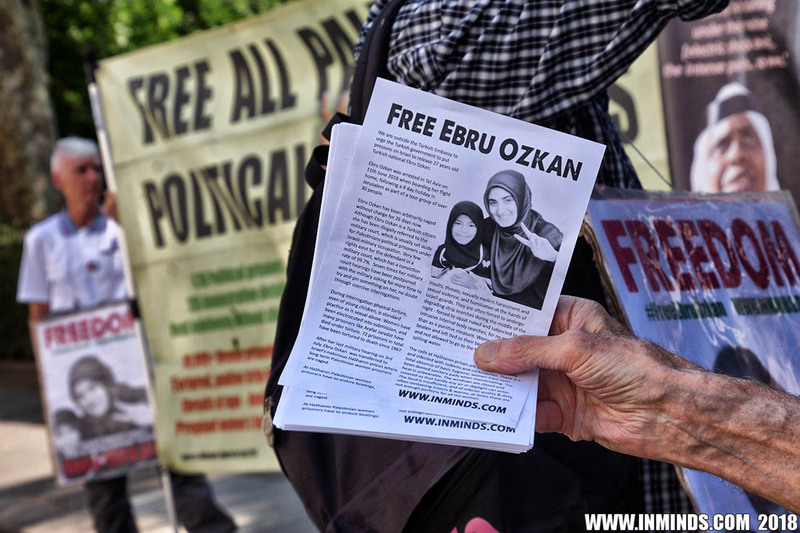 The Turkish government has the necessary means to secure Ebru Ozkan's release. 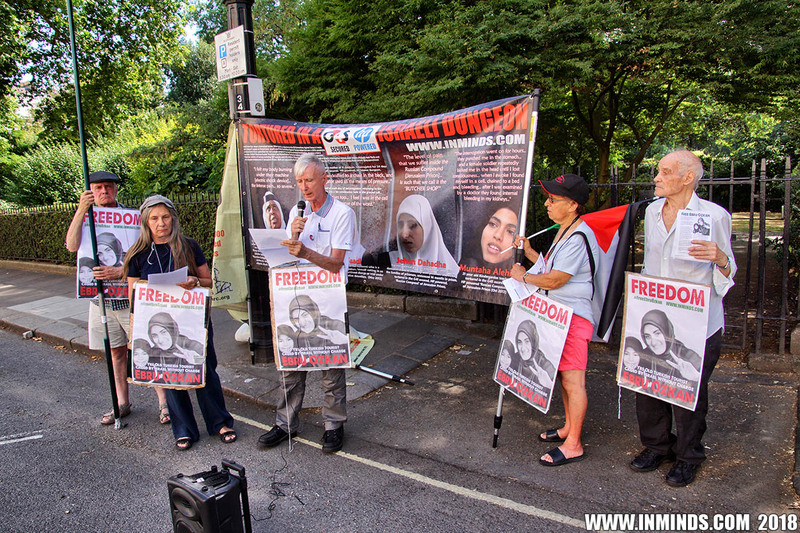 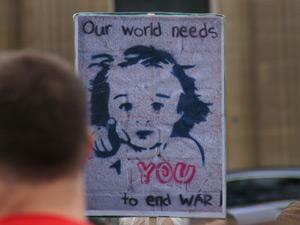 If they refuses to act NOW to free her, then they are complicit in her imprisonment and suffering." 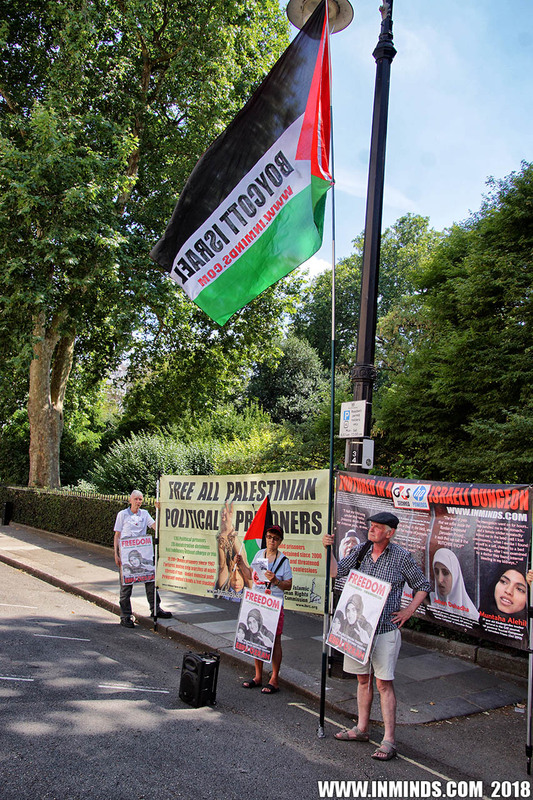 A bizarre zionist entourage consisting of two people and one Israel flag came to counter protest against us, when one of them stood in the middle of the road waving an Israeli flag the police dragged him away warning him of arrest as he was endangering the traffic.